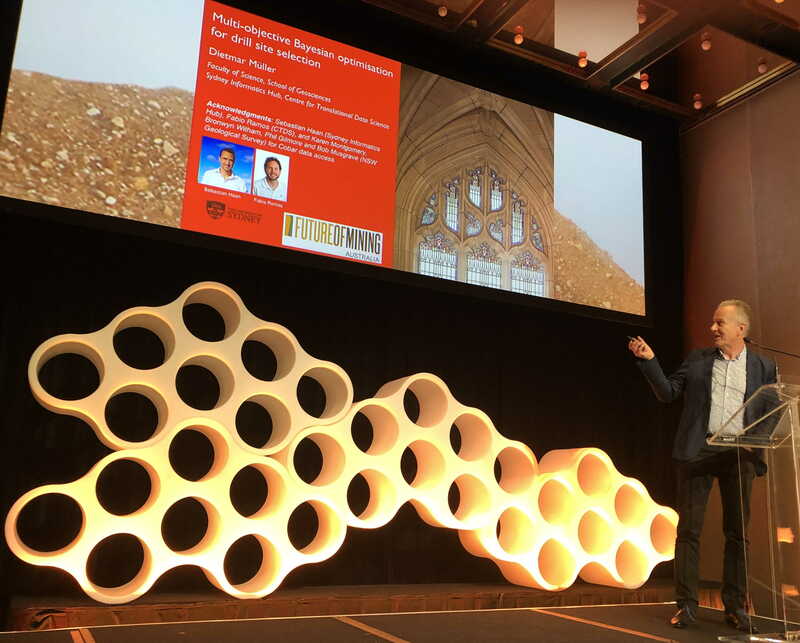 Dietmar gave an invited talk at the 2019 Future of Mining conference in Sydney, with co-authors Sebastian Haan from the Sydney Informatics Hub and Fabio Ramos from the Centre for Translational Data Science. The talk covered how Bayesian optimisation can be used to invert surface geophysical data and physical rock properties derived from drill data together to compute 3D crustal models with uncertainties. Then this model is combined with user objectives including for instance greenfields vs brownfields exploration, cost minimisation and considering surface constraints to select the optimal drill site location. The method could potentially be used for iterative 3D modelling while drilling.